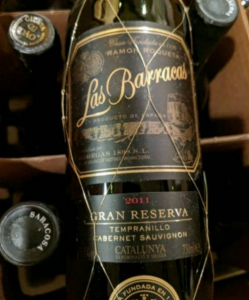 This wine, Ramón Roqueta Las Barracas Tempranillo – Cabernet Sauvignon Gran Reserva 2017, has perhaps the longest name of any wine we’ve reviewed here. It was a WSJ Wine Club selection, which, as part of their initial subscription offer, brought the price down to under $7 – a big savings from the average $17 price reported by Vivino. Unfortunately, for me at least, this red blend didn’t work. I found it a bit dry and a little acidic. Some black fruit, but not enough to offset the fairly short finish. This may reflect my preference for new world wines vs. old world, but so be it. I gave it 3 stars at Vivino. Drinkable, but I won’t buy it again, particularly at anything near full price.